Produced from stainless steel to minimize corrosion, rust and staining with water, our imported SH310 sculpting tool is designed for producing small to medium works in Plastilina, self-hardening and water-based clays as well as wax and plaster. Heating its ends also makes this an ideal tool for Encaustic wax painting. Designed and crafted for flexibility, our SH310 has a squared off spatula end for cutting and scribing (marking sharp, clean and definitive lines in your work). 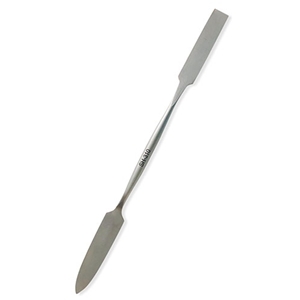 Its opposite end is a medium flat trowel primarily used to apply and spread your choice of sculpting material.